1812 (8 July) FL (four page) sent by Capt. 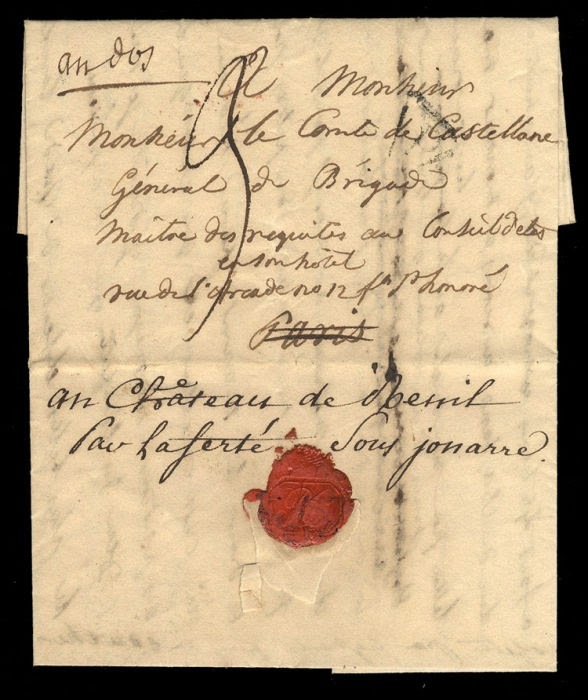 de Castellane to his father, General de Brigade, count de Castellane in Paris, forwarded to chateau a Reuil, charged "3" (deci) as postage was paid only to Paris, with triangular "P" handstamp, contents incl. references to the army being in the vicinity of Dinanburg and the river Dwina, 500 leagues away from Moscow….Adolphe de Maussien was in Warsaw and announced that the King is returning…the food here is excellent, although the soldiers have no bread and horses are without feed…"